Thank you to our dear Cook'n Club Member, George Ross, for sharing this yummy looking recipe! 1.Heat oven to 375 degrees F. In 10-inch skillet, cook beef, onion, bell pepper and seasoned salt over medium heat, stirring occasionally, until beef is brown drain. 2.Stir hot water, 3/4 cup of the milk and the Sauce Mix into beef mixture. Stir in brown sugar and ketchup. Heat to boiling, stirring occasionally. 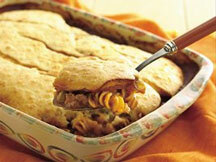 Spoon beef mixture into ungreased rectangular baking dish, 13x9x2 inches stir in uncooked pasta. Set aside. 3.In medium bowl, stir Bisquick mix, remaining 1 cup of the milk and the eggs until blended. Pour evenly over beef mixture. 4.Bake cobbler 30 to 35 minutes or until light golden.